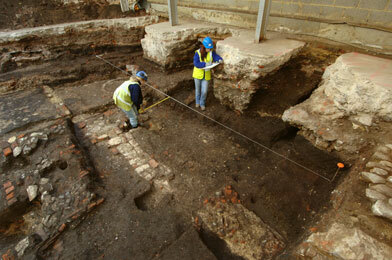 The location of London’s first purpose built playhouse, called The Theatre, built in 1576 by James Burbage, has been confirmed by Museum of London Archaeology following investigation of the site, currently a disused warehouse, in Shoreditch, Hackney. Shakespeare wrote and performed at The Theatre between 1594-7 and Romeo and Juliet was almost certainly premiered there. 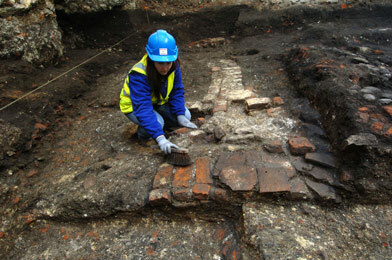 Findings from the current excavation are the remains of what is believed to be the inner wall of the polygonal theatre. There was probably no outer wall but a series of brick piers supporting the upper floors. A sloping gravel surface uncovered by the Museum’s archaeologists would have been the yard in which audiences stood, exposed to the elements. The direction of the slope suggests that the stage is likely to have stood just south of the current site. Finds within the yard include a fragment of 16th-century pottery featuring the image of a man with beard and ruff. In 1597 following a disagreement between the Burbages and their landlord, the wooden structure was dismantled and taken south of the river to become part of The Globe theatre. As Museum of London Archaeology prepare to cover the remains following the excavation, plans to build a new theatre on the site have been announced by The Tower Theatre Company, one of London’s leading non-professional theatre organisations. The trustees of the theatre company are planning to create a 21st century equivalent of the original theatre, a no frills, hardworking place of entertainment. It is hoped that the planning process will begin in April 2009. An architect has designed a building which preserves the historic remains in situ, and both Hackney Council and English Heritage have been encouraging in the preliminary phases of this exciting project. If the plans are approved by Hackney Council, The Tower Theatre Company Trustees will launch The Theatre appeal to raise £3.3 million to build the new playhouse, which will be both a home to the Company and a local arts resource. £1.9 million has been raised to date, and a further £1.7 million secured towards this exciting project. Commenting on confirmation of the origins of the site, Penny Tuerk, Chairman of The Tower Theatre Trustees said; “We have a unique opportunity both to preserve the heritage of The Theatre and develop a modern space for small-scale arts and theatre in Hackney. It is a very exciting project and our vision is to create a modern-day venue for all to enjoy”.